Easthampton City Arts & the City of Easthampton’s Planning Department, working in partnership with Dpict, are thrilled to announce the Easthampton Futures Project, a series of facilitated community workshops that will invite members of our community to envision and articulate the future of Arts & Culture for the City of Easthampton. We propose an interactive and collaborative process to identify ideas, establish priorities, and work with City officials to bring these ideas into being. Graceful navigation of this transition will create lasting impact, today and tomorrow. 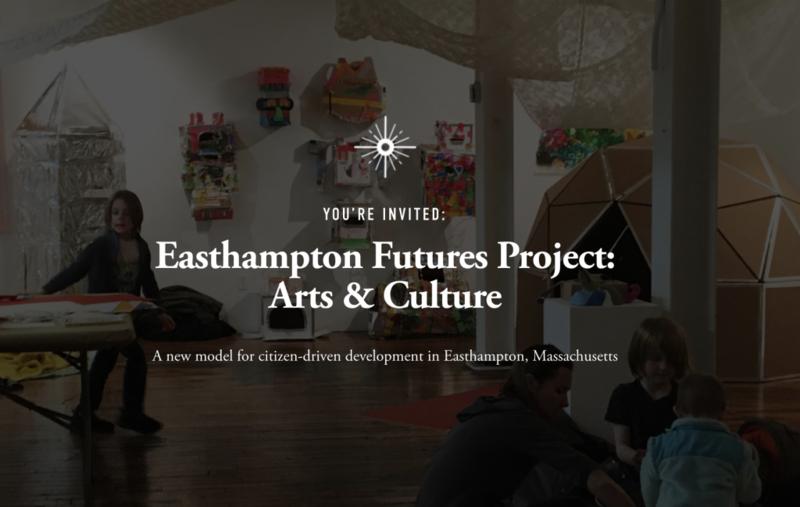 We will start with exploring the future of Arts & Culture in Easthampton. We learn about who we are, what want want, and how we hope to participate in the making of our collective future. We will engage in an interactive and creative exploration of what is possible, and what it might take to get there. We will develop a draft vision that will lay the foundation for our future work. We we will explore possible futures and their implications. We will play “what if?” and evolve our thinking about what we want to put in place in Easthampton, and what our individual roles are in realizing it. We will land our vision for the future of Arts & Culture in Easthampton, and engage in structured design work around goals and strategies. We will share the outcomes of the public workshops, celebrate our work, and commit to weaving together a future we all want. Anyone living or working in Easthampton, Westhampton or Southampton is invited to participate. Take advantage of this unique opportunity to meet your fellow citizens and engage in a creative exploration of the future of Arts & Culture in Easthampton. Each working session is limited to 100 people. Childcare will be available onsite.